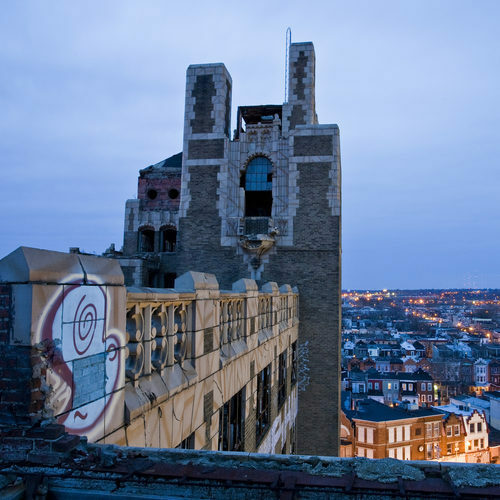 Abandoned Philadelphia | What Would YOU Do With 40,000 (or 50,000) Vacant Properties? Are you tired of looking at the abandoned houses on your block? Sick of seeing so many vacant houses in the neighborhood? Well, so are we. And we want to do something about it. Something other than let them sit there deteriorating and destroying neighborhoods until the City finally gets around to selling them to speculators at the Sheriff sale. We know that can take years. We want to turn these properties over to homeowners and others who will invest in them, rebuild, and ultimately renew and strengthen the fabric of Philadelphia’s neighborhoods. We need your help! We are calling on all of you who have not given up on Philadelphia to join us in identifying and publicizing those properties you most want to see turned over. Post addresses and pictures of these eyesores and neighborhood-destroyers. We will take it from there. Email us information, photos, and any other info to: abandoned@axcelcap.com. Have you or other neighbors called 311 or filed online 311 complaints? If so, how many times, and what was the result? Have you or other neighbors contacted the owner? If so, how many times, and what was the result? Please note, information should be about vacant properties only. All information received will be treated confidentially. REALLY? FORTY THOUSAND PARCELS? $3.6 BILLION? Here is a link to the study published by Econsult Corporation, a leading economic consulting firm that pegs the financial burden to the City of Philadelphia for vacant property at $3.6 Billion in lost household wealth, more than $20 Million in annual City maintenance costs and $17 Million in lost property taxes annually. This is a great concept on an area of real estate that is so often forgotten about. I don’t think there has ever been a comprehensive plan to effectively redevelop this extensive housing stock. Thanks Doug. I know you and your investment group have been doing your part in Philadelphia and Montgomery Counties. Keep up the great work! I actually added a link on my website to this blog and look forward to sharing upcoming posts from other investors/developers. I think you are right on the money. Developing properties brings familes back to the city. Which helps with jobs, schools and the tax base. Thanks Gary. I know you’ll be there along with me and the rest of us committed to cleaning up the vacant property situation in Philadelphia. Any exciting new projects you care to share with the world? Philadelphia must come together to turn all the blight back into BEAUTY! Nice blog. With the help of community stakeholders and our elected officials, we can make this happen. I have been making the rounds with some of the City Council candidates and asking their positions on vacant property in the City. While everyone acknowledges this as a huge problem, there is no consensus on a range of solutions. Having worked extensively in acquiring abandoned properties for nearly ten years, I don’t have a clear answer, but I believe both private and public initiatives need to be pursued aggressively. Since the City’s primary mechanism for turning over abandoned properties (Sheriff Sales) has been burdened with mortgage foreclosures and the demands imposed by the recent Federal investigation into missing funds, it is unlikely we will see significant action from the City any time soon. I say let’s ramp up private and community efforts to identify and work on those properties in our immediate areas. Every citizen can make a difference if they report abandoned buildings to this site. We will do what we can to help move the process along. I recently did an inventory of abandoned houses in my small community I now have 13 pages (no lie!!) of abandoned properties and this does not include vacant lots!! Some are privately owned and some are government owned. Most are tax delinquent. This is outrageous and has caused our neighborhood great harm!! I am very interested in your research. I have spent the past several months putting the finishing touches on a system to allow me to search the abandoned property in Philadelphia. My goal is to turn over as many of these as I can by contacting the owners, buying their interest, and either developing them myself or bringing in others who can and will develop them. To be clear, I am in this to make a living, but I hope that my development efforts will benefit the community at large and the immediate neighbors on the blocks affected by blight. Would you post your findings or would you prefer to communicate offline? Mr. Maxwell…..our Community group encourages development. But, we want responsible development. We live in a historical neighborhood, blighted but rich in history. What would be most beneficial to our neighborhood would be infill and rehabilitation of abandoned homes that compliments the character of the houses that still stand and once stood. Developers are profit oriented (and we understand that) and it might not be cost effective for them to take on such projects in our neighborhood at this juncture. But, we know that our community is primed for future revitalization because of its rich history, location and awesome potential. But, the economy, etc. works against us for the time being. So, while we recognize the dire the need for development (rehabbing, infill, a revitalized commercial corridor) we remain cautious about the type of development that potential investors are willing to do right now. Nonetheless, A few members would be willing to start a discussion with you. are their any abandoned buildings that are not up to code in center city? Please respond to this comment, and provide address’s. thanks. Probably too many to list here. What is your immediate interest? I found this site hoping to find myself a property to rehab for personal and family use. After reading some of the comments, my only concern is that the little guy, like myself, isn’t squeezed out of an opportunity to gain from the acquisition of some of these properties by the larger more saavy developers. Derrick, nothing to worry about. The big developers (and we are a SMALL developer) either can’t be bothered by single lots or houses or they have the political pull to have the PRA (Philadelphia Redevelopment Authority, formerly the RDA) condemn parcels through eminent domain. Also, with so many abandoned properties, there are certain to be some located in an area you have interest. Feel free to contact me directly at info@abandonedphiladelphia.com and we can discuss how to move forward. Do you have any information. I am, too in the same position I want to find a property for rehab and use it as our primary home. Any info would be really appreciated. Thanks. The viola Street Residents Association is looking for private individuals as well as developers to do infill development and rehab of abandoned houses in East Parkside as part of our “Project Reclaim”. We are located in the East Parkside section of West Philadelphia. East Parkside is on the national historical registry and some houses are on the local historical Registry. The area suffers from disinvestment, but has a very promising future. I’m in the process of looking for an abandoned property in order to set up a safe house for women and children experiencing domestic violence in the city. There is currently one emergency shelter tailored specifically for this population in the city, it turned away about 7,000 families last year because it was full to it’s capacity. I would appreciate any help that I can get. Thanks! How are these shelters funded? Do you have a property in mind that would fit your needs? I live in, statistically, one of the poorest neighborhoods in Philly, Allegheny West. This area is flush with abandonment. I wouldn’t even know where to start. Walk down any block in this area, and you are bound to see multiple abandoned homes. Some salvageable, some not. On my block, there are three abandoned apartment buildings, three abandoned row homes, and a vacant church. I can imagine that there could be some confidentiality concern here, but as you are already posting some addresses, those could at least pop up on a map. As it becomes populated, patterns could emerge, allowing communities to unite around this cause and even developers to zero-in on where to invest. I feel really fortunate to have come to this discussion. I work at 22nd and Norris in North Philly. The area is full of vacant lots, shells and abandoned buildings. I’m ready to invest in my small way to have better homes in the area, healthy food stores and places to chill for kids and adults. If enough individuals work together perhaps we can salvage a few buildings at a time. I’d love to talk with any of you to hear your thoughts and learn more. I read some of the comments. They are all good. I have seen a lot of abandon houses in South West Philadelphia where I live. I really need a building to cater to the needs of children. Feed them, clothe them, preach to them, teach them etc. I love taking care of children. It will be a great blessing for me to get a house to start with. My prayers will be answered. I use my home right now but, it is too small.